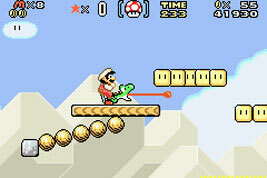 Remake of Super Mario World on the Game Boy Advance. New additions include a sidequest to find all the Dragon Coins (they were optional collectables in the original) and the ability to switch from Mario to Luigi, giving you a higher jump, less traction, and many item-specific changes. Also available is the Mario Bros. Classic multiplayer game for up to four players, and can be connected to any of the Super Mario Advance games.